Blue Point Brewing decided that since oysters are so prevalent around their Long Island brewery, they wanted to try their version of an oyster stout, a style that's been around for over 100 years. 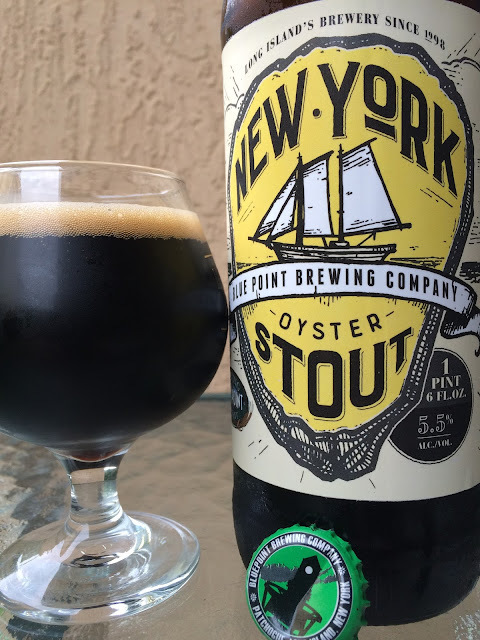 New York Oyster Stout uses those local oyster shells and bay salt to help keep this tradition alive. 5.5% alcohol. 27 IBU. Bottled on SEP092015. Nice cocoa with lightly roasted malty aroma. Super creamy and velvety texture, even milky, really nice. Cocoa flavors come first with some coffee nuances. On the thinner side, though the beer really coats the entire palate and sticks, just an observation. As the beer warmed up a bit, the roasty flavors gained a little momentum, even showing some smokey aspects. Each sip also had a background briny, salty "hint of ocean" type finish to it. Interesting though not pronounced, a little weird in a beer (not just this beer, rather just this style), though not off-putting in any way. I liked it just fine!